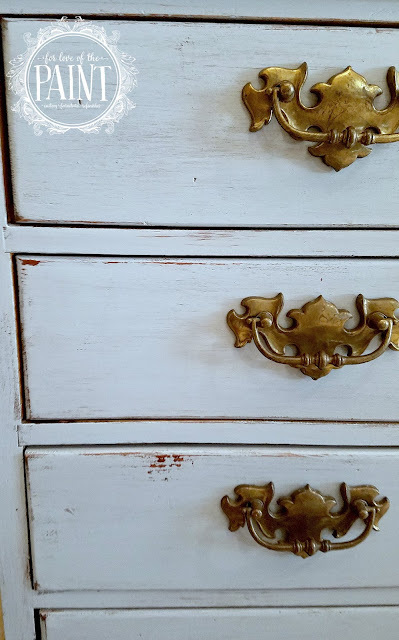 One of the first chalk paints I tried when I was first starting out was Annie Sloan Louis Blue, and I confess I had a lot of difficulty with it! I would always end up with darkish blotches in my wax application, whether I used a rag or a brush to apply, whether I used straight strokes or small circles, and whether I applied a tiny amount or a moderate amount at a time. (This is before I realized there were options other than wax!!) Finally I managed to find a technique that worked for me, which was to mix a small amount of paint into the wax to tint it, and I came out with a much smoother, more refined look. Fast forward to this week, and this sweet classic pine 5-drawer dresser. It is the perfect size for any space, but needed an update from the 60's / 70's wood color. I adore a good textured wood surface, with little grain, nicks, dings, whorls, and generally just a lot of personality! How did we get there? Read on for the techniques! The pine wood texture was embraced with a gorgeously distressed, chippy farmhouse style / vintage cottage look. When a piece has a texture like pine with beautiful rustic elements, I like to use more of a dry-brushed technique to enhance that beautiful surface. I distressed the high points and edges, as well as lightly over the entire surface of the piece. To seal (without those blotchy areas I saw years ago!) I used General Finishes High Performance Top Coat in Flat. I even went back over some strategically selected areas that were wet with sealant (which temporarily can lift the water-based paint from the surface) and pushed the bristles backward into the paint to create a more "chippy" look to complement the usual sanding block distressing. Louis Blue is a light, clear blue that blends well into any decor! The color is a true, cool light blue, but is a bit of a chameleon and can appear to be different shades, depending on the lighting in your space. We decided to keep the original patina on this gorgeous bronze hardware, and it really pops with the lighter, farmhouse or shabby chic surface! You could also update it with a little gilding wax to make it even more modern. I love that you can "dress up" or "dress down" this kind of versatile piece with accessories! Which style suits your home?